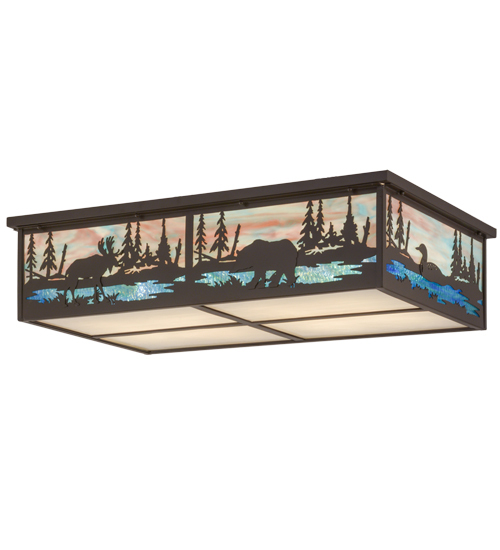 Description: Invite the Great Outdoors inside your home or business with this stunning lighting design, which features the majestic Elk and Bear meandering around a Blue, Green and White woodland lake with a beautiful sky background blending Pink, Plum, Blue and White art glass. The art glass shade, created using Meyda's famous copperfoil construction, is complemented with decorative accents and hardware in a Timeless Bronze finish. Crafted by skilled artisans at the foothills of the Adirondack Mountains in Upstate New York. Custom sizes, styles, colors and dimmable energy efficient lamping options are available. UL and cUL listed.